Limited edition collectible Yoda Action Figure. Digitally scanned from mint Kenner originals! Packaged on a 1981 Empire Strikes Back-inspired blister card. The Jedi Master includes an authentic snake accessory! 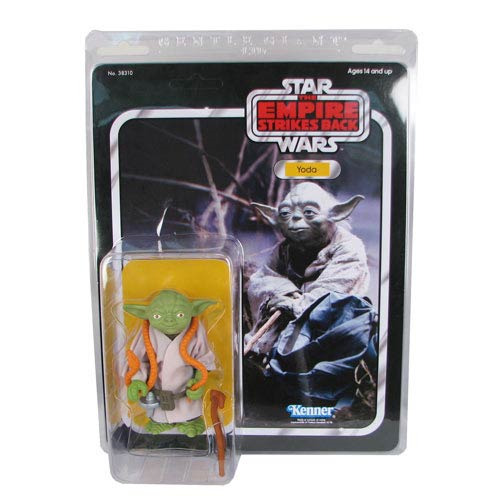 With a commitment to remain in line with the vintage Kenner theme, this Yoda with Snake Action Figure comes packaged on a 1981 Empire Strikes Back-inspired blister card featuring original photos and artwork, including a resealable plastic outer clamshell to help protect and display the limited edition Star Wars collectible. Digitally scanned from mint Kenner originals and reproduced to a substantial 6 1/2-inches tall, no detail has been overlooked. Injection molded and made of durable plastics, this jumbo figure of the Jedi Master includes a faithfully reproduced snake accessory and comes fully articulated. Ages 14 and up. Just like they were when you were a kid, only bigger! Gentle Giant is proud to bring you its line of vintage Kenner-inspired Star Wars action figure reproductions.